There are 8 Assisted Living Facilities in the Bangor area, with 5 in Bangor and 3 nearby. To help you with your search, browse the 15 reviews below for assisted living facilities in Bangor. On average, consumers rate assisted living in Bangor 3.7 out of 5 stars. Better rated regions include Belfast with an average rating of 4.0 out of 5 stars. Caring.com has helped thousands of families find high-quality senior care. To speak with one of our Family Advisors about assisted living options and costs in Bangor, call (855) 863-8283. "Maine's Queen City" since 1834, Bangor, Maine, on the Penobscot River is a prime location to enjoy and provides easy access nearby cities where seniors can partake in whale watching, fishing, fairs and festivals. The Bangor area features 8 assisted living communities, with five in the Bangor city limits and three in the nearby areas of Orono and Brewer. These facilities cater to seniors who need assistance with their activities of daily living, including eating, dressing and bathing. The average annual temperature in Bangor, ME, is 44 degree Fahrenheit, and the annual average snowfall is 66 inches. Residents should be prepared for long, cold winters and low temperatures all year round. The air quality in Maine is among the best in the country, and the American Lung Association lists Bangor as one of the cleanest cities for ozone air pollution. Residents are able to check for updates daily, so they can be aware of any potentially harmful changes. The cost of living in Bangor is 2.1 percent higher than the national average but 2.1 percent lower than average for the state of Maine. The Bangor area is home to world-class medical facilities, including Eastern Maine Medical Center and St Joseph Hospital, in the event of medical emergencies or illness. Bangor is a member of the AARP Network of Age-Friendly Communities, meaning that its elected leadership “has made the commitment to actively work toward making their town, city or county a great place for people of all ages,” according to AARP. Bangor has an array of community resources for seniors, including Gateway Seniors Without Walls, an organization that runs a variety of programs and activities for seniors, as well as one other senior center. Assisted Living costs in Bangor start around $0 per month on average, while the nationwide average cost of assisted living is $4,000 per month, according to the latest figures from Genworth’s Cost of Care Survey. It’s important to note that assisted living rates in Bangor and the surrounding suburbs can vary widely based on factors such as location, the level of care needed, apartment size and the types of amenities offered at each community. 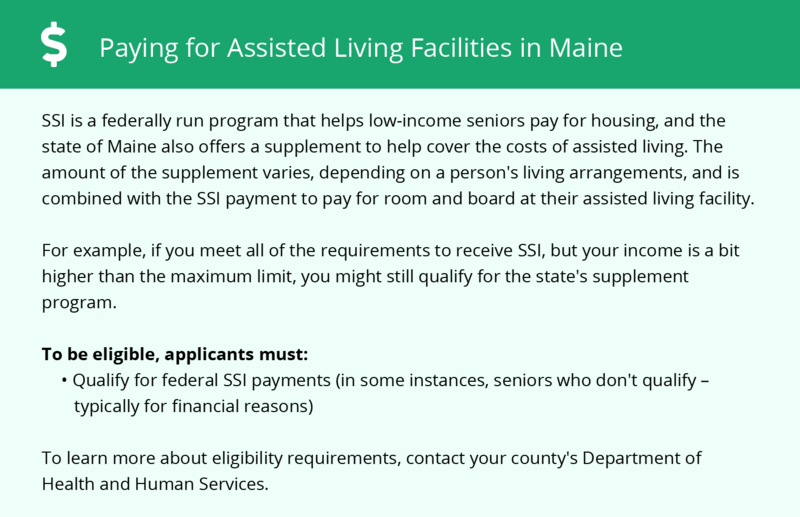 In Maine, the state funded medical program, MaineCare, covers the cost of an assisted living community. 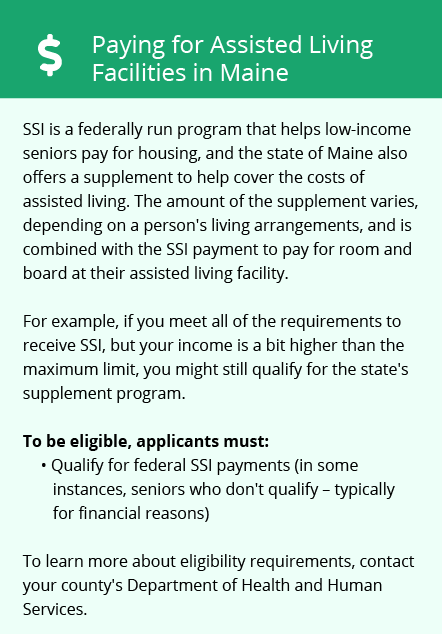 As long as seniors meet the financial eligibility criteria for MaineCare, they may have the entire cost of their assisted living unit paid for by the state. Bangor and the surrounding area are home to numerous government agencies and non-profit organizations offering help for seniors searching for or currently residing in an assisted living community. These organizations can also provide assistance in a number of other eldercare services such as geriatric care management, elder law advice, estate planning, finding home care and health and wellness programs. To see a list of free assisted living resources in Bangor, please visit our Assisted Living in Maine page. Bangor-area assisted living communities must adhere to the comprehensive set of state laws and regulations that all assisted living communities in Maine are required to follow. Visit our Assisted Living in Maine page for more information about these laws.